Genome editing reagents including the recently introduced CRISPR/Cas9 system have become established and widely used molecular tools to answer fundamental biological questions and to target and treat genetic diseases. 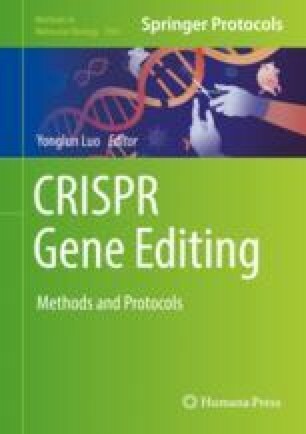 The CRISPR system, originally derived from bacteria and archaea, can be delivered into cells using different techniques, comprising (1) transfection of mRNA or plasmid DNA, (2) electroporation of plasmid DNA or the Cas9 protein in a complex with a g(uide)RNA, or (3) use of nonviral or viral vectors. Among the latter, Adeno-associated viruses (AAVs) are particularly attractive owing to many favorable traits: (1) their apathogenicity and episomal persistence, (2) the ease of virus production and purification, (3) the safe handling under lowest biosafety level 1 conditions, and (4) the availability of numerous natural serotypes and synthetic capsid variants with distinct cell specificities. Here, we describe a fast and simple protocol for small-scale packaging of CRISPR/Cas9 components into AAV vectors. To showcase its potential, we employ this method for screening of gRNAs targeting the murine miR-122 locus in Hepa1–6 cells (using AAV serotype 6, AAV6) or the 5′LTR of the human immunodeficiency virus (HIV) in HeLaP4-NLtr cells (using a synthetic AAV9 variant). We furthermore provide a detailed protocol for large-scale production of purified AAV/CRISPR vector stocks that permit higher cleavage efficiencies in vitro and are suitable for direct in vivo applications. Julia Fakhiri and Manuela Nickl contributed equally to this work. J.F. and D.G. are grateful for funding from the Cystic Fibrosis Foundation Therapeutics (CFFT, grant number GRIMM15XX0) as well as from the Heidelberg Biosciences International Graduate School HBIGS at Heidelberg University. D.G. acknowledges funding by the Collaborative Research Center SFB1129 (German Research Foundation [DFG], project TP2), the Cluster of Excellence CellNetworks (DFG; EXC81), and the Transregional DFG Collaborative Research Center TRR179 (project TP18, Projektnummer 272983813). M.N. and D.G. are grateful for additional funding from the German Center for Infection Research (DZIF; TTU-HIV 04.803). Moreover, M.N. appreciates funding from the Heidelberg Innovation fund FRONTIER (project “A CRISPR way to eradicate viral pathogens”).